Ad-Aware Anniversary is the latest version of Lavasoft’s industry leading anti-spyware solutions. 10 years of malware experience combined in one dynamic application. Ad-Aware - Anniversary Edition offers radically improved performance and efficiency, along with comprehensive malware protection. With real-time monitoring, threat alerts, and automatic updates you can rest easy knowing that you are protected. 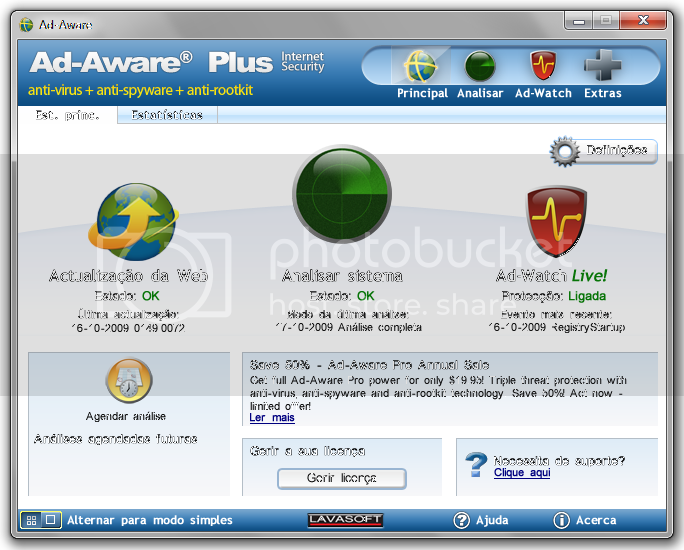 Ad-Aware Free's on demand scans detect and remove spyware and other forms of malware. With behavior-based threat detection and integrated real-time monitoring, Ad-Aware Anniversary Edition focuses on core consumer security needs. Instead of adding layers of bells and whistles - thereby slowing your computer and scans down - we have decided to focus on what really matters. Anniversary Edition provides advanced threat protection, and is significantly lighter and faster than our previous versions. Ad-Aware Anniversary protects you from spyware that secretly takes control of your computer, resulting in aggressive advertising pop-ups, sluggish computer activity and even identity theft through stolen private information. We give you the tools to detect hazardous content on your computer, clearly identify their threat level, and then give you the control to remove unwanted content, so that your private information remains right where it should - under your control. Lavasoft’s advanced Code Sequence Identification (CSI) technology roots out deeply hidden malware and then searches for similar codes in order to identity emerging variants. Ad-Aware Anniversary thoroughly scans your memory, registry, Hosts file, hard, removable and optical drives for known data-mining, aggressive advertising, parasites, scumware, keyloggers, trojans, dialers, malware, browser hijackers, and tracking components. While our competitors are busy creating new bells and whistles that most computer users will never need or use, we continue to focus on developing a trusted anti-spyware product that is designed for real people! Ad-Aware Free continues the Lavasoft tradition and spirit by providing a no-strings-attached, full powered free anti-spyware product that is safe, thorough, and easy to use. This new version, boasting improved threat detection and usability features, reinforces why computer users continue to put their trust in Ad-Aware more than any other anti-spyware program. Protect the private information on your computer with Ad-Aware, the original and most trusted anti-spyware program that thoroughly detects and removes both known and emerging malicious threats. Surf the Internet with peace of mind and let Ad-Aware shield you from dangerous intruders and prying eyes. Preserve your computer investment with regular scans to identify and remove malicious applications that eat up memory and steal bandwidth so your computer runs as smoothly as the first day you bought it. Conquer the complexities of battling malware with our user interface that guides the everyday user through the maze of security threats, while offering advanced options for the specialized needs of IT enthusiasts and professionals. Ad-Aware helps you combat the growing threats and latest advancements of malware and malicious spyware. • Detect, Remove AND Clean. A step beyond simply detecting and removing malware, Ad-Aware intelligently cleans and restores your system by removing all traces of the infection. • NEW! Ad-Watch Live! Basic. Integrated real-time process protection blocks malicious processes and infected programs that try to start or run on your system, to prevent them from further integration in your system. • Rootkit Removal System. Advanced anti-rootkit technology protects you from hidden threats and stealth attacks that are designed to gain access to your system by avoiding detection. • NEW! Radically improved resource efficiency. The new version provides ultimate resource efficiency with minimal strain on your system's resources. • NEW! Lavasoft SmartSet. Let the experts at Lavasoft guide you. Lavasoft SmartSet makes scanning and cleaning as easy as possible - by providing automatically configured settings for scans, and by providing recommended actions for found infections. • NEW! Customizable Profile Scans. Easily create personalized scan profiles so that Ad-Aware only scans areas that you select. Save time by scanning areas where known malicious programs are located, or choose from 13 different sections to scan, including critical sections, only executables, ZIP files, and the Windows registry. • NEW! External Drive Scanning. Scan your external storage device, iPod, DVD’s, USB’s, or any other drives that you connect to your PC for an additional layer of security. • NEW! Pin-Point Scanning. Quickly identify whether suspicious files are safe or malicious - right-click any file or folder to perform an immediate Ad-Aware scan or to make a submission to Lavasoft researchers for analysis via ThreatWork. • Easy to download, install & use. Effortlessly maneuver the complexities of malware detection and removal with our new, user-friendly interface. • Automatic Updates. Protect against the latest forms of malware with faster, updates to guard your privacy against cyber attacks throughout the license duration. • System Restore Point. Set a Windows system restore point so you can clean-up your system without fear of obstructing your operating system – revert to a previous state in the event of a problem. • TrackSweep. Control your privacy by erasing tracks left behind while surfing the web on multiple browsers, including Internet Explorer, Firefox, and Opera, with one easy click. • Full integration with Windows Security Center. Get Ad-Aware protection and status notifications through the Windows Security Center. • Supported Languages. English, Dutch, Flemish, French, German, Italian, Portuguese, Spanish, Traditional Chinese, Simplified Chinese, and Japanese.